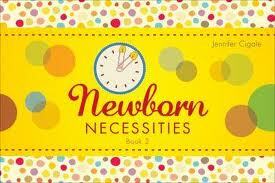 LOVING the Newborn Necessities book for my new kiddo. He is nearly 12 weeks now and this book helped keep mommy, daddy, grandma and our caregivers all on the same page. We captured our breastfeeding times and sides along with wet and dirty diapers. This is ESSENTIAL to newborn functioning in those early weeks. It is also helpful for when you go to the doctor and they ask you all those great questions. If you happen to have a doctor who might not know or understand breastfeeding. The book helps you LOG your feeding times and wet and dirty diapers. This can prove and SHOW doctors that your baby is doing fine, regardless of how much weight s/he gains. I love it! Here it is on Amazon. I will be sharing this book with those pregnant mommies in my life. You should too! It is a quick, compact, and easy-to-understand way to chart this information, thus leaving you more time to spend with your baby and catch up on your sleep! Here is the author's site, too! Come back on Friday to Checkout our Rafflecopter Giveaway! I'm expecting a little on in May! thanks for the chance! would love to win this for my sister, who's expecting her first!